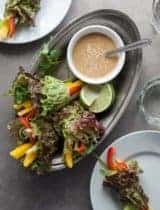 A fresh vegetable filled wrap with a creamy, cooling basil hemp seed sauce that’s perfect for lunchboxes, picnics or a light meal. I’m a bit infatuated with wraps lately. 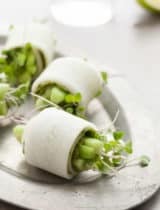 I attribute that in some part to my increasing desire for fresh raw vegetables during the warmer months of the year, but the real genius of wraps is that they are so simple to prepare yet endlessly adaptable. In fact making raw vegetable wraps is really more assembly than it is cooking. 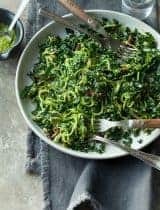 You start with a hearty green for the base like chard or collard leaves, add a pile of thinly sliced vegetables, then finish with a generous drizzle of dressing and the whole thing is done before you know it. 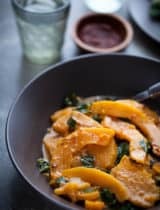 It’s an ideal vegetable-rich dish to make if you’re in the mood for something other than a salad that’s conveniently portable too. Each bite is crunchy and creamy and exploding with flavors and textures. 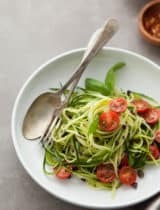 While you can use whatever vegetables you’d like or happen to have on hand I’m partial to the combination of bell peppers, cucumber and zucchini paired with a creamy basil hemp sauce. If you have a mandolin, you can quickly cut your vegetables into matchstick sized pieces, but a good chef’s knife will do the trick as well. The sauce, which I like to drizzle inside and use the leftovers for dipping, is what really brings everything together. A lusciously creamy blend of hemp seeds, olive oil and basil. 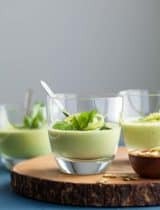 it has a clean herbaceous flavor from the basil with a nutty, garlicky undernote from the hemp seeds and a touch of fresh garlic. If you’ve never tried hemp seeds before, they are worth seeking out. With a mild nutty flavor that works well in all sorts of dishes they offer the added benefit of being one of the best sources of plant based protein along with omega fatty acids and fiber. The sauce is delicious in its own right and you’ll find yourself tempted to dip everything in sight into it, or at least I am. Have you tried hemp seeds? 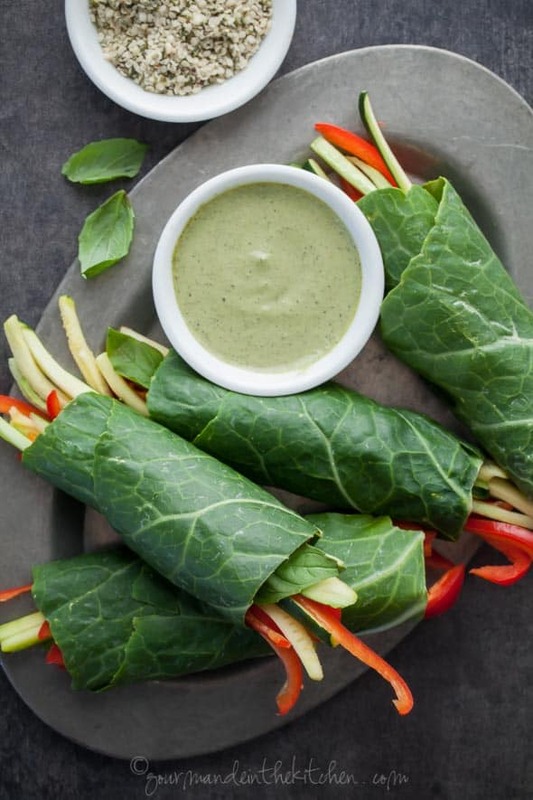 A fresh vegetable filled wrap with a creamy, cooling basil hemp seed sauce that’s perfect for lunchboxes, picnics or light meal. Soak the hemp seeds with the filtered water in a small bowl and set aside for 20 minutes. In a small blender or food processor combine the soaked hemp seeds, olive oil, lemon juice, basil leaves, garlic, salt and pepper. Blend on high until smooth and creamy. Cover and refrigerate to thicken for at least 20 minutes before making the rolls. Slice off the stem and trim down the thick part of the stalk running through the leaves by sliding a sharp pairing knife down until it is the same thickness as the leaf so as to roll more easily. If the leaves are particularly large cut them down the center to make two pieces. 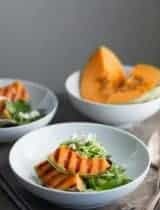 Arrange a reserved leaf on a cutting board and top with a small stack of sliced vegetables. Place a generous spoonful of the basil hemp cream across the top of the vegetables. Roll up, starting with the base of the leaf tucking in the ends like a burrito if you’d like. Repeat with remaining filling, sauce and leaves. Cut in two if the rolls are large and serve with additional sauce on the side for dipping. That sauce looks so dang good!!! SO healthy and it looks so delicious! These are absolutely gorgeous and right up my alley Sylvie. I seriously love all things wrapped or rolled in green! This sauce sounds incredible, too!! So many beautiful vegetables! 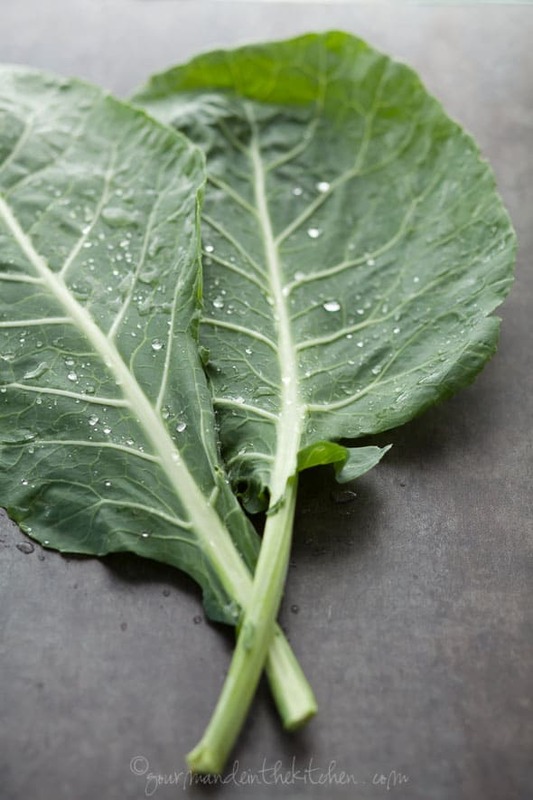 I love lettuce wraps, but I haven't branched out to using collard greens yet -- now I definitely want to give them a try. Love that vibrant sauce too. 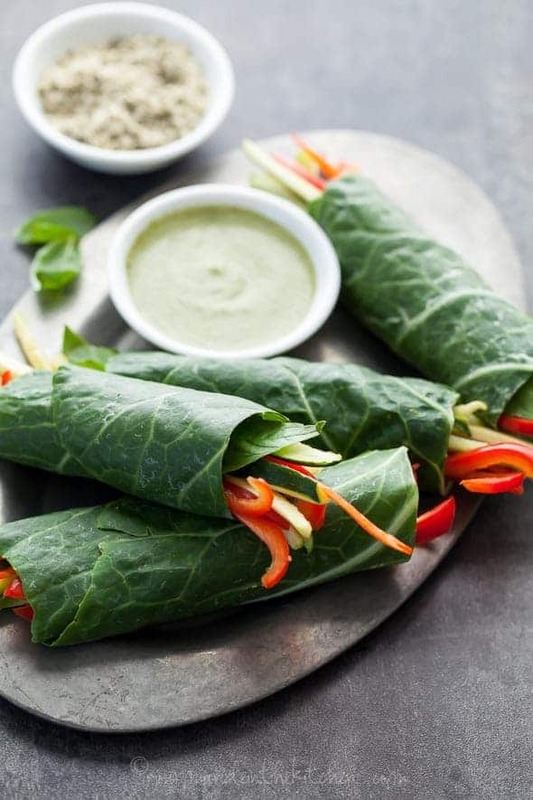 Gorgeous wraps, I love the basil sauce! Unfortunately not yet, but I'm very curious! Actually I've been wanting to try it for some time after seeing recipes with hemp seeds on food blogs. 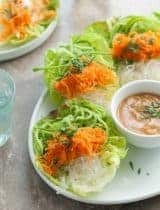 If I was shopping in grocery stores, etc I'd never learn or notice it, so it's great to see a new way to enjoy fresh veggie wraps with dipping sauce! Such beautiful pictures!! These wraps look seriously so so fresh! I haven't tried hemp seeds yet - on my list to try though - great idea using it in a sauce. I haven't tried hemp seeds, but I will now. These wraps look amazing and don't get me started on that sauce! Yummmm I'm looking forward to giving it a try! Healthy and delicious. A keeper during Summer! What do you do with the basil leaves ? Put them in the sauce? Yes, thanks for catching that! I've updated the recipe to reflect that now.